Still practicing on that one Essbee, but its a heavy beast. 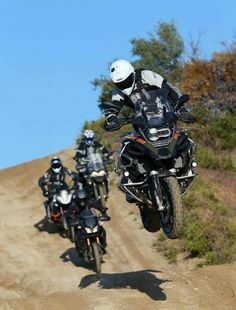 On the GS one wheelies at a greater speed so the camera man/woman needs to be fit to run along to capture the pic. That normally is the wife and she's tired of running next to to the bike. I don't inderstand the problem altogether. They are going to appear, them pics.. I can feel it in my water..
And yeah Marc.. Few people understand this phenomenon..
Hee hee....I have a solution : wifey sits on another bike, back to front, and that scoot rides in front. ps.....I also did a fender-bender on my XR500 many decades ago....only once....my arse was frikkin PURPLE!!!!!!!! Meerkatting is standing up, on your pegs. Its apparently done mainly by BMW riders, any KTM rider that may do it is instantly branded a closet BMW fan. Understood Mr Zog. Is this form of riding frowned upon? I just need to ensure that its then practiced on a private, isolated road only. It does however help to stretch the legs now and then on a long haul. Arn't all those orange bike riders closet BM fans anyway ? It is frowned upon, but mainly by the Katoom brigade. And a few others who try to gain points from the Katoom twats because they tend to ride slower bikes and need some form of affirmation of manhood. I do it cause its fun!